If you're on the lookout for a casual yet stylish getup, choose a navy shawl cardigan and Kenneth Cole Reaction Jeans Slim Fit White Jeans. Both garments are super comfortable and they also look stunning paired together. Brown leather loafers are a fitting choice here. 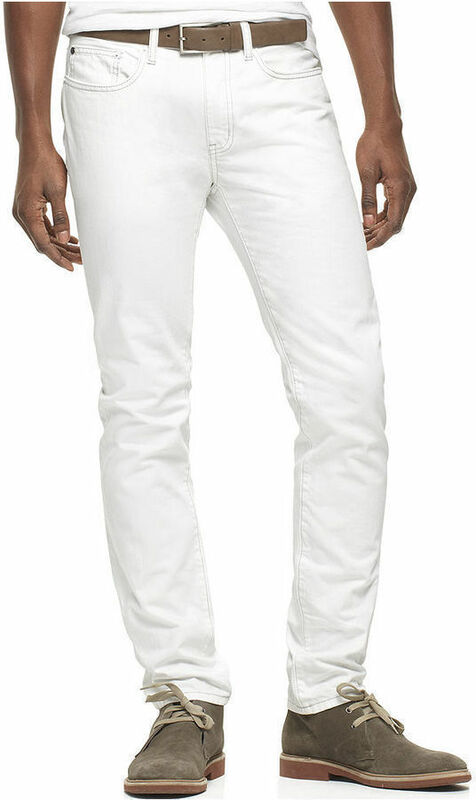 This combo of a grey blazer and Kenneth Cole Reaction jeans slim fit white jeans from Macy's is so easy to make up in no time, helping you look awesome and ready for anything without spending too much time going through your closet. 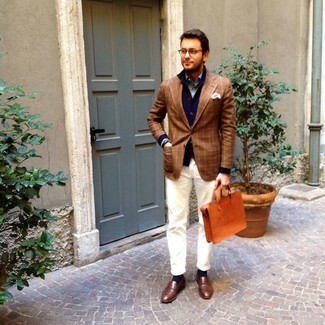 When it comes to shoes, this getup is finished off nicely with tan suede desert boots. 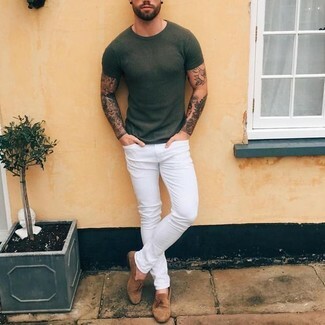 If you're on the lookout for a casual yet on-trend getup, dress in a grey crew-neck sweater and Kenneth Cole Reaction Jeans Slim Fit White Jeans. Both of these garments are very comfy and look amazing when worn together. Round off this ensemble with grey suede low top sneakers. 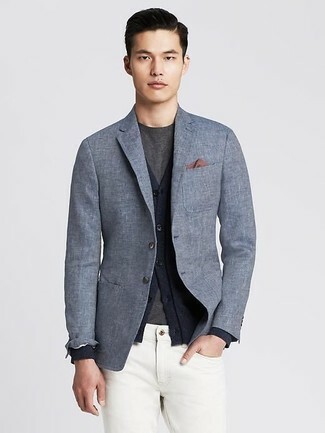 For a casually elegant ensemble, consider pairing a grey linen blazer with Kenneth Cole Reaction Jeans Slim Fit White Jeans from Macy's — these items go pretty good together. 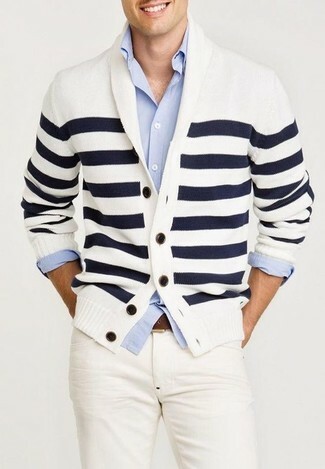 If you're on a mission for a casual yet sharp outfit, marry a white and navy horizontal striped shawl cardigan with Kenneth Cole Reaction white jeans. Both items are super comfy and will look wonderful together. 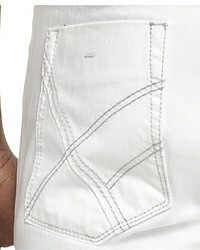 If you're in search of a casual yet stylish getup, wear an olive crew-neck t-shirt with Kenneth Cole Reaction white jeans. As well as super comfortable, these two pieces look great paired together. Choose a pair of brown suede tassel loafers to show your sartorial savvy. 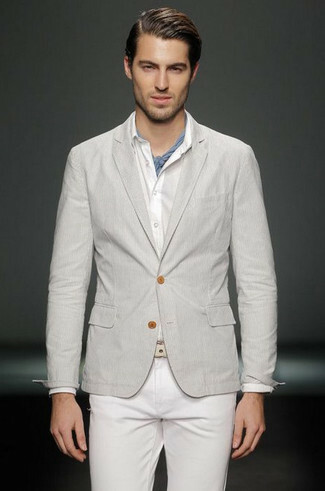 For a casually elegant outfit, opt for a grey blazer and white jeans — these pieces play pretty good together. 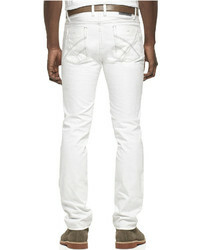 If you're hunting for a casual yet seriously stylish getup, reach for a navy polo and Kenneth Cole Reaction white jeans. Both of these garments are totally comfortable and look fabulous paired together. If you're searching for a casual yet stylish look, wear a navy quilted field jacket and Kenneth Cole Reaction white jeans. As well as very comfy, both of these pieces look fabulous together. Rock a pair of navy leather high top sneakers to make the outfit current.